How was your weekend? Did you celebrate the Independence Day already or are you waiting until Wednesday? This week’s CCC Monday is quite special for me. 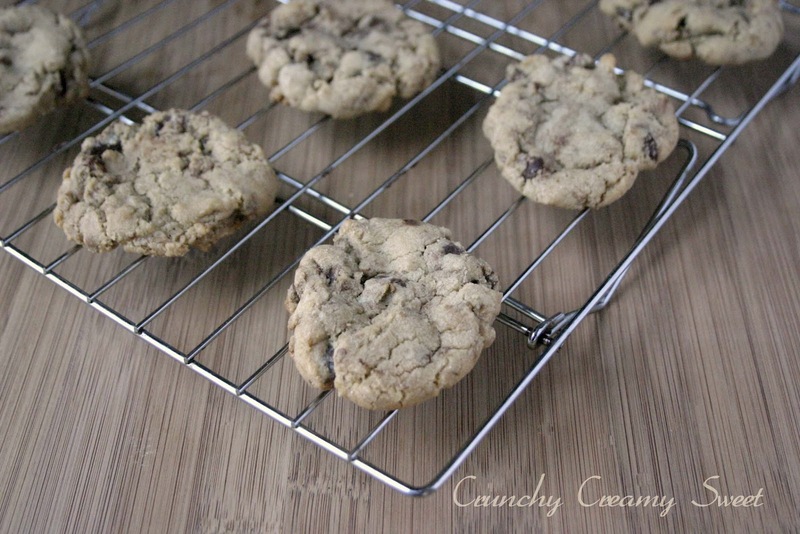 I am going to share with you my very first recipe for chocolate chip cookies. I am talking developing the recipe. Huge! The cookies came out quite delicious! Actually, truth be told, I almost didn’t have any dough to bake them because my Hubby and I were standing over the bowl of it and “tasting” it… We just couldn’t stop! It was so good! Different than any other we had before. It has a very deep chocolate flavor and nuttiness from the brown butter. Who ever came up with the concept of browning the butter for cookie is a genius! Quite encourage by the results, I am thinking I should develop my own recipes more often! Just look at these babies! I love the rustic look. My Hubby totally agrees, which means they are already amazing.They are slightly crispy, slightly chewy inside, quite soft and will remain like that after storing in the cookie jar. 2. Because the butter may still be warm when adding the rest of ingredients, your chocolate chips can start melting in the dough. Therefor it is recommended to place the dough in the freezer for 30 minutes or fridge for 1 hour. From crummy dough to a delicious cookie! 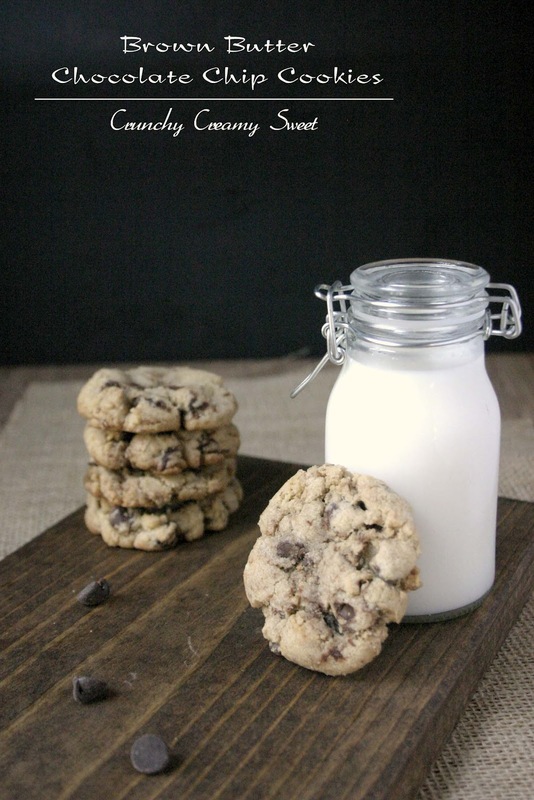 Thanks for submitting these to the Chocolate Chip Cookie Challenge! I think brown butter makes everything better, and your cookies sounds divine. Please add the graphic (http://bit.ly/OcBVgi) to your post and link it to this: http://bit.ly/QBNJJX. That way, we can keep the CCC love going and help cross-promote everyone’s recipes. Thanks Anna! Done and done! Thank you for hosting, Stephanie! Those look like the cookies my mom made when I was a kid! Will do 🙂 Thanks, Anita! Your own recipe!?! I am so impressed! And, I love that it involves brown butter 🙂 Cannot wait to give this one a try! The cookies look perfect – I love that craggy, rustic look too. I'm too intimidated to develop recipes but reading about your positive experience is nudging me towards trying it. Happy 4th of July! Yay! That is my goal. I hope you will give it a try! Thank you! I don't think there is a more intoxicating aroma than browned butter cookies baking. I bet yours were super. excellent recipe! i need to develop more of my own recipes but it can be so daunting, you know? these cookies look absolutely wonderful. you have no idea how much i could go for 1 (or 4….) right now. YUM! I know what you mean, Amy. You just need to take a chance at it. No one will judge it until you share it. I say go for it! Thank you! Yummmmm. brown butter AND chocolate. Can't go wrong. Right? 🙂 Thank you, Grubarazzi! Oh my gosh! These sound so amazing. I can hardly wait to try them. Congrats on making up your own recipe and thanks for sharing! I am so glad you like them, Terri! Thank you! These look just incredible! I always brown butter in cookies now- doesn't it create such a wonderful flavor?! These look so so good. I think you are a natural recipe developer! 🙂 Your pictures are making me so hungry for those right now. I must make these soon! Brown butter and chocolate…a winning combination! Bet these cookies are fantastic. Yay! Congrats on your recipe! They look fantastic, I want to try that extra egg yolk, what does that do?? The brown butter sounds so good in it too! Yumm 🙂 Have a great 4th Anna!! The egg yolk adds liquid, while the egg white tends to dry out the final result. Still my dough was pretty crummy 🙂 Thank you, Kristina! I love when my recipes work out despite my self-doubt! Brown butter in cookies is so good – I still haven't tried letting it refrigerate overnight, but apparently that intensifies the flavour even more! I will have to try that – thanks for the tip, Anna! I never made cookies with brown butter before. Sounds interesting, I am going to have to try this one. Oooooh, you are in for a treat 🙂 Thank you! Yay! Thank you so much, Ann! I even taste half of the cake batter, hahaha! Talk about consuming carbs. You are already so gifted that I'm sure any recipe developed by you would be fantastic. Looks delicious sweetie and fabulous pictures! Love it! I have the same problem when I make cookies. I swear I eat half the dough (at least)! I love the idea of adding brown butter. That just makes these all the more delicious! Way to go on creating these cookies! They sound absolutely amazing, Anna!! Oh, I LOVE brown butter. These are gorgeous. Must have them! i love brown butter – it just adds that wonderful nutty flavor! i have yet to try brown butter in chocolate chip cookies. and i'm pretty sure my life is woefully incomplete unless i do. so i'm definitely bookmarking this! It will change your life, Jenn! 🙂 Let me know how you like it! Congrats on creating your first recipe! You rock girlfriend! These look amazing. 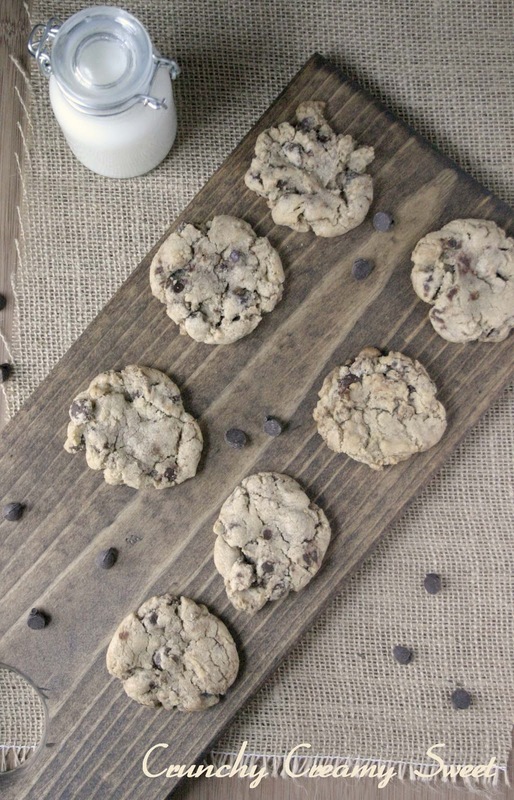 Brown butter brings everything to a whole new flavor level and especially chocolate chip cookies. I've made some killer bb choc chip cookies and they are always requested every time I bring dessert somewhere. Happy Monday, hope you had a fabulous weekend! Hi Emma! Thank you so much! Welcome to CCS! You had me at browned butter…oh my – these sound mouth-melting and look fabulous too. I just love your adorable milk bottle too. So glad you shared. These sound heavenly delicious. 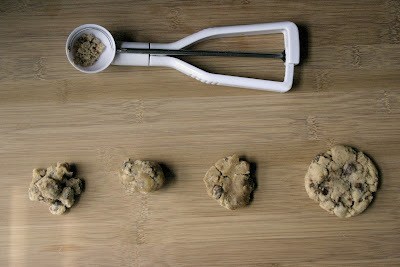 What a great idea … using brown butter in the cookie dough. Please, give it a try – you will love it! Thanks, Ellen! Delicious cookies to have with a cup of hot milk.